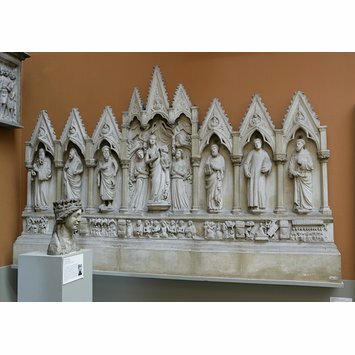 This cast was taken from the original marble altarpiece in the church of S. Francesco, Pisa by Tommaso Pisano. The predella shows scenes from the life of Christ, from left to right: the Annunciation, the Nativity, Christ among the Doctors, the Dead Christ with angels, the Virgin and St John the Evangelist, the Baptism of Christ, the Resurrection and Pentecost. The remains of the incription states that Tommaso was the son of Andrea Pisano and that he executed the work. remains of an incription states that Tommaso was the son of Andrea Pisano and that he executed the work. Tommaso Pisano was the son of the sculptor Andrea Pisano (about 1295-1348/9)and the brother and collaborator of Nino Pisano (d. by 1368). The altarpiece bears traces of colour and the remains of an inscription which states that Tommaso was the son of Andrea Pisano and that he executed this work. 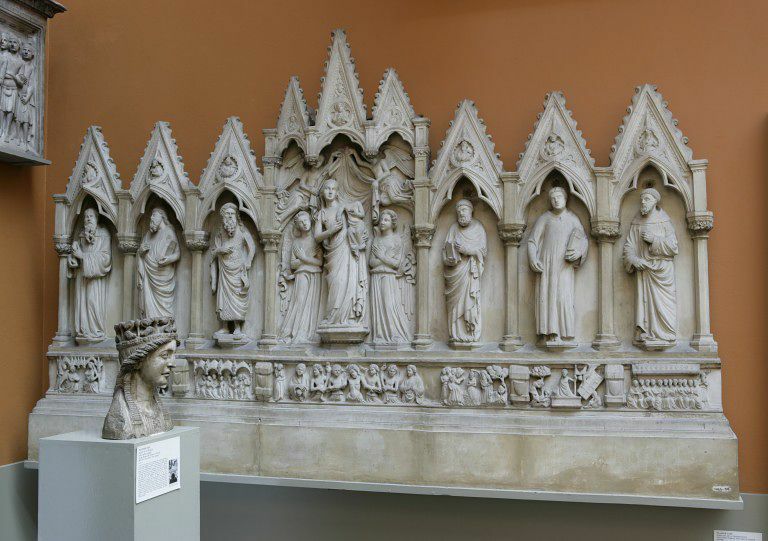 The predella shows scenes from the Life of Christ, from left to right: the Annunciation, the Nativity, Christ among the Doctors, the Dead Christ with angels, the Virgin and St John the Evangelist, the Baptism of Christ, the Resurrection and Pentecost. This object is a 19th century cast of the 14th century original.